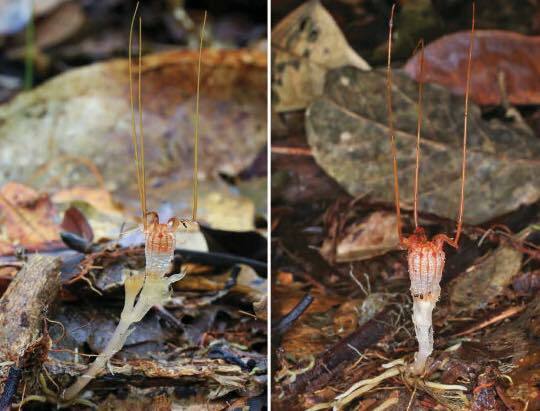 In 1866, the Italian botanist Odoardo Beccari chanced upon a peculiar plant in the rainforests of western Sarawak, in Malaysian Borneo, where he had set up camp. He made detailed sketches of the tiny plant, and many years later, formally described it as Thismia neptunis. There have been no records of the species in the scientific literature ever since. But in January last year, a team of botanists spotted the plant again, 151 years after it was first recorded, in the same rainforest. The scientists also took what they believe are the first ever photographs of the species. 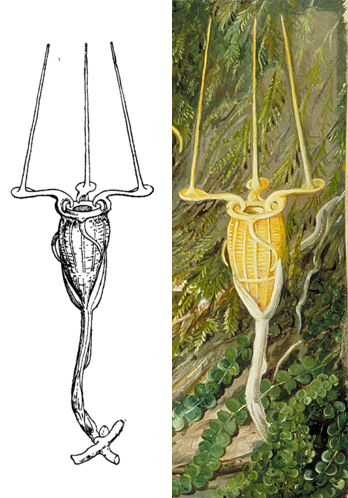 Left: Beccari’s original illustration. Right: Marianne North’s painting based on the original illustration. Via Wikimedia Commons (public domain). Thismia neptunis is tiny, standing at just 9 centimeters (3.5 inches) when flowering. But the small size isn’t the only reason it’s easy to miss. The species belongs to a group of plants that spend most of their life underground. The only time the plants surface above ground is to flower a few weeks in a year. Sometimes, they don’t even bloom every year. Their underground life makes them unlike other green plants. Thismia plants, dubbed fairy lanterns, are mycoheterotrophic, which means they lack leaves and chlorophyll and cannot photosynthesize. Instead, they parasitize fungi for their food supply. Since Sochor’s team studied only two flowering individuals and one bud, they were unable to estimate the distribution of Thismia neptunis. However, the researchers believe the species is likely restricted to a small area of primary lowland rainforest in Sarawak, a habitat that is under immense threat. They also think there might be fewer than 50 individuals, qualifying the species as critically endangered on the IUCN Red List. What are New Zealand’s environmental priorities over the next 20 years? Ecodaily.eu is part of Eco Daily Media Group LLC, which delivers daily news around the globe.